Happy Kitchen Sink Stamps Monday, thanks for stopping by! Sorry for the delay in posting my card for today. I had something created, but just was not thrilled with the final result. Back to the drawing board I went.....life got in the way....and now I'm finally posting my remade card, using the same images and MME papers I started with, but took inspiration from Mojo Monday Sketch #262. I'm a multi layer, sponge girl at heart when I design. It took a lot of will power for me to put the sponge down and not add any additional layers! All pieces were cut using the Silhouette Cameo. Gotta love the fact that it makes designing and cutting your pieces a breeze. The sweet little Elephant and sentiment are from Kitchen Sink Stamps Multi Step 'lil Elephant set. To embellish I added Eggshell Seam Binding that I tied in a Double Bow and a Guava Button tied with Jute. 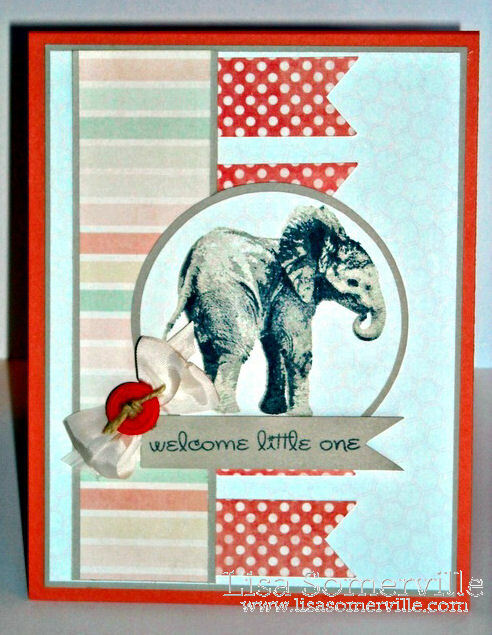 I love the fabulous papers and fun layout you have used with your sweet elephant today, Lisa! So adorable with the jute tied button!! CUTE!!!! The KSS elephant is growing on me. I am ALMOST to the point of purchasing it. I really like what you've done w/ your card today, though! Love this elephant and you always make the cutest cards with him! Adorable use of the sketch!